The Norwegian industrialist Atle Brynestad founded Seabourn Cruise Line in the mid eighties in order to establish a new standard in the ultra-luxury market. Originally the line was to be named Signet Cruises, but was finally christened Seabourn Cruise Line in 1987, as the latest and most ultra-luxury cruise operator. Marketing activities were conducted from a San Francisco office under the direction of Warren Titus, one of the most experienced cruise marketers in the luxury segment, who had previous experience with Royal Viking Line. An order was placed with Schichau Seebeckwerft in Bremerhaven for two ships costing $ 50 million each, with an option for a third. Its first ultra luxury cruise ship, the Seabourn Pride, made her maiden voyage in November 1988. A sister ship, the Seabourn Spirit, sailed on her maiden voyage in November 1989. The option for a third ship wasn't taken up before the December 1989 dead line. This ship was afterwards built as Royal Viking Queen for RVL and was later acquired by Seabourn in January 1996 and renamed Seabourn Legend. The three ships were built from the same plans and were relatively alike. 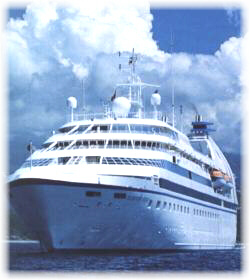 In 1991 Carnival Corporation had already acquired a stake in Seabourn and later took over the line. In 1999, Seabourn Cruise Line was converted into a division of Cunard Line Limited, which also owns and operates Cunard Line. Then Seabourn Sun and the two Seabourn Goddesses joined the fleet from sister company Cunard. In mid-2001, Seabourn Goddess I & II were sold again to the original Seabourn founder, Atle Brynestad, and the largest ship of the fleet, the Seabourn Sun, was transferred to sister company Holland America Line in April, 2002, and now sails as Prinsendam. Now, the Seabourn branch only owns the original trio of yacht-like cruise ships. 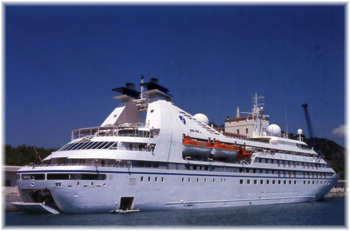 The Seabourn first ship, Seabourn Pride entered service in 1988. Planned and built as a larger and even more comfortable alternative to Cunard's Sea Goddesses (back then Seabourn's major competitors), she was a 10,000 gt motorship, with an elegant and rakish design, small enough to provide a friendly, comfortable ambience, but large enough to feature more cruise amenities than her smaller Sea Goddesses duo. The sleek bullet-shaped hull design has extensive glazed areas for the forward sloping front of super suites, bridge and observation lounge, with inward sloping twin funnels aft, which really dominated her profile, with lattice struts and diagonal extension down to deck level. The aft appearance was boxy, mainly due to the tall hull that contains a portable marina, far from the pleasant lines forward. But the industry wide trend (in the luxury end segment of the market) was towards larger ships with more passenger capacity, and also, with the potential for more revenue due to suites with balconies, soon redefined the concept of the luxury segment. 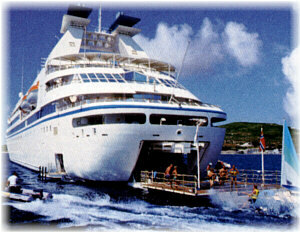 Previously luxury was identified with yacht like ships, such as the Sea Goddess pair, or the Seabourn trio. But the new generation of luxury cruise ships are far more likely to carry between 400 to 1,000 passengers, featuring a gross tonnage around 40,000 tons gt. The Seabourn Spirit looked small next to these ships, and they were considered a small ship within the cruise industry. The latest Silversea pair were more than twice the size of the Seabourn Pride and carries as many as 388 guests with a crew complement of 300. This results in the highest space-to-guest-ratio in the industry. But a lot of people liked the intimacy of the Seabourn trio, in spite of the roomier suites and the public space of the Silversea fleet. This revolution in the ultra-luxury market was due mainly to Silversea, with its fleet of four small to mid-sized ships, in a yacht-like atmosphere, which features large suites with big balconies. Other challengers in the de-luxe market, such as Radisson Seven Seas or Crystal have also made big investments in new ships, with a level of facilities better than that found on first generation ships. A larger ship offers more space for roaming, bingo, souvenir shopping, art auctions, a larger gym area, a kid's zone or a larger pool, etc. Some people think that big ships are better suited to families. I agree. So, what is the Seabourn's answer? First, her small size. What is the border between a small cruise ship and a super yacht? Seabourn marketering sold its vessels more like a mega-yacht than a cruise ship. Ship size is a personal preference thing. A lot of people actually liked the smaller, more intimate feel and the exclusivity found on small cruise ships. Second, Seabourn fitted some cabins with balconies. But a small ship is worse for a motion sensitive passenger. I imagine in a rough sea you will get quite a lot more motion than the larger ships. As with all ultra luxury cruise ships designed by the Norwegian architects Yran&Strorbraaten, the Seabourn Pride had a vertical layout, which means that all the ship's suite accommodation is located forward and all public rooms aft. The advantage: a quiet forward section, where the passengers can sleep in a silent atmosphere. But the disadvantage is of a long distance between the forward cabins and the public lounges, also a bigger use of both stairs and elevators over a ship with horizontal lay out, well balanced by the concentration of climbing devices (two lifts and the spiral stair) in the atrium zone. Going from restaurant to theatre does include, for example, a two decks elevator (or climb the stairs). Another elevator staircase/lift tower was located forward. The border between the forward and aft sections contains the atrium and elevator block. The fact that the atrium hasn't glass integrated elevators is an example of the different concepts that guide the design of the Seabourn's ships. I enjoyed the light of this space, crowned by a skylight on deck 8. This fact, as well as the light brown, earth tone carpeting, creates an airy and open feel, which exudes elegance and space. The atrium was crossed by the fore and aft corridor on cabin decks, and the atrium well hadn't the size found on larger cruiseships, and her design was reminiscent of the spiral staircase found on the former Royal Viking Sun. Glass and golden stainless steel railings, and painted passenger deck bulkheads, combined with a grey floral carpet which spans all decks, gives the atrium a futuristic and sophisticated touch, helped by the well designed and discreet lighting. The decor on the Seabourn Spirit was elegant, upscale, and there was plenty of space to explore but really nowhere to go, because the animation was low key and the choices were limited: the Club with adjacent small casino, or the show lounge. There wasn't a disco on board. So, don't expect much late-night partying. The low ceilings were a disappointing point. The atmosphere was upscale, but in a genuine way. No one seemed to be trying to impress anyone else. All passengers were well-travelled people, with an average age, which depends on the cruising region and itinerary, but usually range from late 40s to late 60s. Seabourn passengers can be intensely loyal: over half of the guests habitually were repeaters, some having accumulated hundreds of days onboard during prior cruises. The 150 officers, staff and crew are primarily Scandinavian with European hotel staff. A no tipping policy is a strictly observed aboard Seabourn ships. The level of service on Seabourn was excellent. The passengers had a lot of time on her hands during the sea days, but were happy to enjoy themselves with a good book, or with one of the most interesting activities on board, conversation with the other guests. There was a good library of books and videotapes, but not enough activities elsewhere on the ship. The Seabourn Pride had more than enough public rooms for her small capacity. Compared to megaships, Seabourn Pride featured all the room the passenger needed, but at a reduced size. Also, in some points, the ship is beginning to show her age: skylight structures with small signs of rust, local wear and tear of the carpets, etc. But guests quickly discover that they were only signs of maturity and the classical elegance of a ship built in an era prior to large open atriums, soaring ceilings, and multiple dining rooms. There were things about Seabourn that guests like very much. The fruit, the bottle of champagne and two complimentary bottles of liquor, the chocolates that the stewardess left at turn down along with roses, rose petals and other surprises, the Molton Brown toiletries, etc Seabourn has a lot of details for her passengers. Wine at lunch and dinner was complimentary, from a limited list. Gratuities are included in the cruise fares, so the traditional solicitation and envelopes are not present here. Seabourn also has a complimentary shore excursion program. On each cruise, at one port of call, there was one free shore-side event to which all passengers were invited. These events are often a highlight of the voyage. It was the all-inclusive concept. The champagne flows liberally, there were opportunities to eat caviar, etc because Seabourn charged only for premium wines and highest end of the market spirits. The formal dining room is located traditionally amidships on deck four, the lower passenger deck. The galley is located aft this deck. The Restaurant has no set dining times or seatings, and you can dine with whomever you choose, whenever you choose. The entrance was narrow from the atrium, and had a brown marble floor. The white painted coffered ceiling was plain and very low, in spite of some mirrors. The main restaurant is drop dead elegant, with widely spaced tables, the finest china and cutlery. But overall had a poor and, for my personal taste, plain Scandinavian décor, which lacks warmth and is a bit stark. Only three or four nice prints dot the walls and the low lighting at night makes everyone look more glamorous. A small ensemble entertains as one dines lavishly, and later the captain and his staff dance with passengers on a large marble dance floor. The food was really good and the Chef checked the dinners of all passengers on a number of occasions as he came around to insure everything was right. All dietary, vegetarian and light issues were soon fulfilled by the Seabourn, staff. All women get the arm of a waiter when they enter the dining room. Casual breakfast, lunch and, on some evenings, dinner, are available in the Veranda Café, located aft the pool on deck seven. It had both outside and inside sections. The outdoor section was best, with her semicircular lay out and teak deck. The reservations-required Veranda Cafe offered alternative dining, with themed menus at night (French, Mediterranean, Surf and Turf). So, Seabourn offered the choice to dine under the stars and also the possibility of not having to dress up even on formal nights. The Chef told us that reservations were often booked up for the Veranda Cafe, but then half the people ended up not showing. As a consequence, it was possible to dine there even if you can't get a reservation: just show up anyway and chances are you will be seated. The food in the Veranda Cafe was served with less pomp than in the main dining room, or had more native flavour, while tables in the Veranda Café were set with Rosenthal porcelain in a contemporary style. The white table service is a mix of two patterns: epoque and Loft. Also, during the day time, the Veranda Café offered some excellent buffet breakfasts under umbrellas. Passengers also have the option of ordering dinner in their cabin, as well as breakfast and lunch, served course by course. Weather permitting, there may be burgers served on the deck at lunch. Dinner is an extraordinary experience, featuring cuisine that rivals that of the finest land-based restaurants. The Restaurant was decor-wise, about as bland as the room's name. But you soon forget once the food starts arriving. Thanks to the consultation of celebrity chef Charlie Palmer, the multi-course menus feature not only old traditional favourites, but new enticements. The chef tries to pick up fresh ingredients at ports of call. 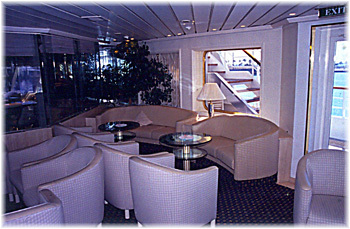 The Magellan Lounge, located aft deck five, was the main gathering place on board. Night time cabaret-style entertainment was featured here, and included comedy acts, singers, and concert performances. The stage was large enough to handle song and dance acts, as well as local folkloric, and that's what Seabourn offers. There were not highly staged revues as in the case of larger ships. Daytime lectures were also held. Large enough to hold all passengers in one seating, the room has good acoustics and enough room in between rows to move about freely. It had an annular lay out around the marble stage, and the rows featured a slope towards the stage. The carpet was blue and brown, but the Magellan lounge wasn't a dark room. In day time, there was a lot of light here thanks to her three side picture windows. Forward, the Seabourn Pride also had a computer centre with four work stations with Internet and e-mail access, and a card room. The Club, located above the Magellan Lounge, with its tan leather chairs and glass wall connecting to the small casino, was mainly used for before or after dinner drinks and dancing. A four-piece orchestra/dance band played here as well as piano and a marble dance floor was located under a skylight, the room was divided by cleverly placed glass partitions for more intimacy. The pale beige colours on furniture (sofas and large chairs) created a wonderful contrast to the blue carpet beyond. The headroom was low, but the designer tried to create a roomier effect with the use of a white painted ceiling, with indirect lighting and mirrors. The bar was located in the forward port corner of the room, close to the casino. The onboard casino is very small with a dozen slots, one roulette wheel & two blackjack tables. This is not a ship for big gamblers. The corridor from the atrium to The Club was very nice; it featured large portholes and the glass bottom of the pool, but also a disappointing stainless steel ceiling. 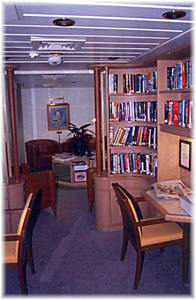 Forward, close to the atrium, was located the small library was located which offered complimentary videos for in-cabin viewing and a few books, with a leather and clear wood decoration. The boutique could use more upscale products. As in most cruise ships, my favourite room on board Seabourn Pride was the Observation Lounge, a tranquil oasis with floor to ceiling forward-facing windows, ochre-coloured leather chairs and furniture, and low cocktail tables which constitutes the perfect spot for watching arrival and departure in port. In this circular shaped room the carpet was blue, as well as the curtains, and this colour scheme, as well as the nautical maps in the corridor, gives it a nautical flavour. 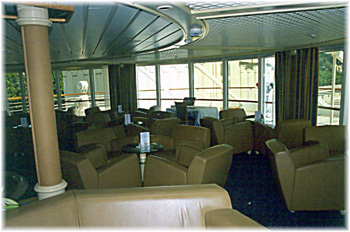 The Horizon Lounge was in the bow, above the wheelhouse, in the upper deck an offered a great view ahead. There was a counter on the starboard side which offered cigars and cognac, the perfect complement for the leather furniture. The Horizon Lounge was under utilized: it is open for early risers coffee and continental breakfast, and also a nice afternoon tea each day, but mostly closed at night. The heath spa and fitness centre were well equipped for a small vessel. There were six large treadmills machines and other fitness facilities include an aerobics area, workout room, three treatment rooms, steam and a beauty salon. Because space is tight in the gym, exercise classes are held in The Club. The Seabourn Pride features large outdoor deck space on decks seven and eight, all teak decked. Cushioned plastic deck lounge chairs, usually at a premium on most ships, are plentiful on the sun deck, which is separate from the pool and located one deck up. The tables were wooden and fitted with umbrellas, whereas the rest of the outdoor furniture was plastic made. The ship also has a small, oddly placed swimming pool on its top deck between the funnels. So, the outdoor deck around the pool was a shaded area in the centre of the ship and there is no seating around it. Also, the ship featured three whirlpools including one hidden in the prow that couples can reserve for a romantic evening complete with champagne and caviar. For two hours during sea days free mini massages are available on the sun deck. These Seabourn ships have an aft water sports platform that opens out into the ocean from the stern of the ship providing a launch for watersports when at anchor in port. This facility features windsurfers, sailboats, zodiacs, water skis, banana boat, pedal boats, and snorkel equipment. When weather permits, passengers can use all this equipment free and also go swimming from the fold-out marina. An enclosed steel mesh pool allows passengers to swim right in the ocean (to keep guests in and sea life out). The Sky Bar, with its "U" shaped wood counter always has American grill specialties. Weather permitting, an outdoor Sky Grill was set up near the Sky Bar for grilled chicken, hot dogs and hamburgers, salads and other offerings. As an alternative to a show at night, a movie may be shown outside on the sun deck. As built, a standard feature of the Seabourn Pride was 26 m2 outside suites. Also, the ship had six super suites. While they are among the priciest ships afloat, with very large staterooms, originally only the six super suites had private verandas. All other staterooms had 1,5 meters double glazed picture windows. 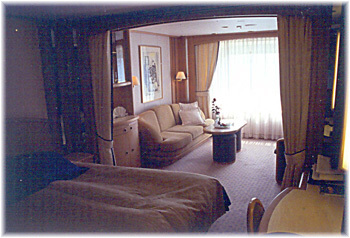 Seabourn rectified this in 2000 by adding French balconies (sliding glass doors with mini-veranda) to 44 of the standard Seabourn Suites (about one third of her suites). 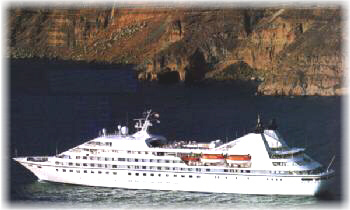 Seabourn Pride was also the first of the sister ships to be equipped with French balconies in May, 2000. This created a new category called Seabourn Balcony Suites. It consisted of cutting a hole in the side of the cabin, including the window, and replacing it with a large, sliding door with a small teak step and railing. This allowed the three sisters to compete (at least in the marketing side) with more modern ultra luxury ships fitted with real balconies. On the inside, Seabourn Suites and Balcony Suites are the same, measuring 26 square meters, with separate sitting area with sofa and two chairs, twin beds (that can be combined to make a queen size bed, covered with duvets), adequate walk-in closets, TV/VCR, a coffee table that can be raised for dining, a refrigerator stocked with various complimentary beverages, and large lighted vanity units complete the elegant décor. A blackout curtain over the picture window is electrically operated. The large marble bathroom had two sinks and a marble vanity unit, as well as a large bathtub, hair dryers and designer toiletries. Four suites can be combined to make two doubles. Spirit and Pride also differ from sister ship Legend in that their bathrooms have double sinks, not one (although on Legend, the additional counter space is quite nice) which facilitates joint primping before formal dinners. From 2004, all Seabourn suite beds were fitted with sheets, pillowcases and duvets from Frette, the Italian famous linen maker. In addition, there are two 37 sq. meters Classic Suites, four suites convertible to Double Suites measuring 52 sq. meters and four Owner's Suites measuring around 54 square meters. The latter were the most spacious on board. They were located under the wheelhouse on deck 6, and follow the rounded form of the superstructure here. Each had a large semicircular sofa facing the large windows, two walk in closets, two bathrooms, and butler service. There was also a small forward facing true balcony, with wooden lounge chairs and drink table. There were also two owners suites in the aft part of the cabin section also on deck six, close the lifts, but they featured windows and balcony with obstructed views! A nonsense for one of the better suites on board. They had the advantage that they were less sensitive to ship motion in heavy weather conditions. The two Classic suites were located under the forward Owner suites, and had their balconies on the side. I think the full balconies had a lot of advantages over the French balconies. This wasn't a true substitute, but it sure was nice to open up the "wall" and look out. The bottom of the balcony was only out about 30-35 centimetres from the shipside. The railing had a Plexiglas sheet that seemed always dirty and hard to see out of. If the outdoor atmosphere was too hot, the doors are totally extraneous, because when you open them all the air conditioning is immediately sucked out of the room. In a lesser severe climate, the doors would be a real asset, letting in fresh air. Seabourn is generally recognized in the travel industry as one of the most luxurious operators in the cruise section. They offered cruises that call both classic ports as well as unusual ports of call, many only offered by Seabourn. The service was good, better than Silversea because the pax/ratio was lower, but Silversea, as the ship was larger, was better in other areas. The pool area on Silversea was far superior to Seabourn's, the entertainment was definitely better on Silversea, and the public areas were thus more spacious. The suites on the Silver Shadow and Silver Whisper were comparable to Seabourn, but there were real balconies on Silversea, unlike Seabourn's retrofitted balconies. The crew and staff were equally good, and room service is available with little differentiation. Seabourn was more intimate, and is more akin to sailing a family yacht, where everybody knows your name. The better asset on both operators were the fellow passengers who were very pleasant and friendly. If life is a choice between Seabourn versus Silversea, it's a pretty good life!! !